Domains: Continuous, Discrete. Size: [n,m]. Kind: Block Diagrams. This model can split one output signal into two or more output signals. 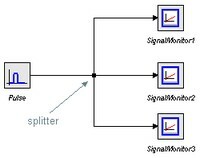 The signals may have either size, but the size of all connected signals should be equal. Any number of input signals (each of the same size) may be connected. The signals connected to this model should all have the same size.